Background: The patients of Adult Lumbar Degenerative Scoliosis (ALDS) are commonly complicated with advanced age, osteoporosis, cardiopulmonary insufficiency, and some other medical comorbidity. Due to the feature of such cases, the traditional open surgery can lead to high rate of postoperative complications. The purpose of this study is to introduce our experiences and explore the efficacy and feasibility of Minimally Invasive Transforaminal Lumbar Interbody Fusion (MIS-TLIF) in the treatment of patients of ALDS whose symptom is mainly single level radicular pain or neurogenic claudication, without dynamic back pain. Methods: From January 2008 to January 2013, a retrospective study of 37 patients with ALDS treated with MIS-TLIF was completed with at least 2 year follow-up. Visual Analog Scores (VAS) and Oswestry Disability Index (ODI) were evaluated preoperatively and at the time of 2 y follow-up. Radiographic measurements included the Cobb angle of lumbar curve, Lumbar Lordosis (LL), Sacrum Slope (SS), and Pelvic Tilt (PT). Radiographic evaluation of the fusion integrity was performed at the time of 2 y follow-up. Results: The mean VAS back pain scores decreased from 4.55 ± 0.9 preoperatively to 2.2 ± 0.8 at 2 y follow-up (P<0.05), and the mean VAS leg pain scores decreased from 8.2 ± 0.6 preoperatively to 0.95 ± 0.8 at 2 y follow-up (P<0.05). The ODI score improved from 60.56 ± 15.1% preoperatively to 23.46 ± 8.2% at 2 y follow-up (P<0.05). The average lumbar curve was 18.7 ± 5.3º. Preoperatively, and 10.3 ± 5.38º at 2 y follow-up (P<0.05). The LL changed from -31.4 ± 12.7º to -37.4 ± 10.1º at 2 y follow-up (P<0.05). Solid fusion was achieved in all patients. Conclusion: The technique of MIS-TLIF can be used to treat the patients of ALDS whose symptom is mainly single level radicular pain or neurogenic claudicationwithout dynamic back pain, achieving favorable clinical outcomes, good fusion, and satisfactory curve correction with less blood loss and complications. The Adult Lumbar Degenerative Scoliosis (ALDS), described as ‘‘de novo’’ scoliosis, was defined as a curve>10º due to degeneration of the facets and discs . The patients of ALDS usually suffer from radicular or neurogenic claudication symptoms and back pain which makes the surgery necessary [2-5]. But the patients of ALDS usually complicated with advanced age, osteoporosis, cardiopulmonary insufficiency and other medical comorbidities, which contribute to the high rate of postoperative complications. Traditional open surgery has been associated with a major complication rate as high as 28-86% [6-8] and the risks of morbidity have been shown to increase with advancing age . In order to lower the incidence of the complication, several minimally invasive methods of treatment for ALDS have been advocated [10,11]. Transforaminal Lumbar Interbody Fusion (TLIF) is the most commonly used method of surgery for ALDS. However, the best option for this problem is still controversial. The advantage of MIS-TLIF is that the MISTLIF operation avoids the dissection and distraction of paraspinal muscles, preserves the attachment and innervation of paraspinal muscles, and preserves the posterior lumbar spinal ligament structures such as spinous process and interspinous ligament. At the same time, by expanding the channel with a special cold light source, the larger operation field and operating space are achieved under the smaller incision . However, the main weakness of MIS-TLIF is that the indications for patients are too narrow. The purpose of this study is to introduce our experience and explore the efficacy and feasibility of the technique of MISTLIF for patients of ALDS whose symptom is mainly single level radicular pain or neurogenic claudication, without dynamic back pain. From January 2008 to January 2013, 37 consecutive patients with ALDS, suffering from one level lumbar stenosis, without dynamic back pain, treated with MIS-TLIF in our hospital, were retrospectively analysed. They were followed up at least 2 y. There were 16 males and 21 females, with an average age of 61.9 y (47-79 y). Preoperative medical and cardiac clearance was required for all patients. Patients with idiopathic curves, prior fusion attempts, degenerative curves below prior fused idiopathic curves, and whose symptoms are mainly dynamic or fatigue back pain, were excluded from this research. All patients had participated in non-operative therapies, including bracing, resting, physiotherapy, and analgesics, without adequate relief of their symptoms before being considered for surgery. Study measures were obtained through review of inpatient medical records and questionnaire. The primary measures of this study were blood loss, surgery time, the time to ambulation, postoperative hospital stay, Visual Analog Score (VAS), and Oswestry Disability Index (ODI). Radiographic examinations were performed preoperatively, postoperatively, and at the time of every follow-up. Radiographic data were collected and evaluated preoperatively and at the time of 2 y follow-up. The Cobb angle of lumbar curve was measured using the standard Cobb’s method on an anteroposterior radiograph, and the lumbar and pelvic parameters were measured on a lateral radiograph including Lumbar Lordosis (LL), Sacrum Slope (SS), and Pelvic Tilt (PT). The radiologic films and CT taken at 2 y follow up were utilized to assess fusion. The fusion criteria were based on Bridwell interbody fusion grading system (Table 1), and the assessments were performed by two independent assessors. Table 1. Bridwell interbody fusion grading system. Before surgery, all cases were treated with nerve root block to make sure the level where the pain comes from. Under general anesthesia, the patient was placed in a prone position on the operating table. The needle is used to position the level under the C-arm fluoroscopy. A 2.5 cm incision was made, and a tubular retractor was placed. Then the trajectory of pedicle screw was prepared. The isthmus, the posterior arch of the vertebrae, and the inferior joint facet were resected. These local bones were kept for autograft during the interbody fusion. The nerve root was identified. Then, discectomy and endplate preparation were performed, and the disc space was packed with the autograft bones. A cage interbody graft was then inserted. The same procedure of instrumentation and decompression were performed on the contralateral side. The lumbar pedicle screws were inserted bilaterally and the progress of compression was performed. Finally, sew up the incision without drainage (Figure 1). Figure 1: The MIS-TLIF technique: A: Position the level under the C arm fluoroscopy. B: The road of pedicle screw was prepared. C and D: The postoperative X-ray showed good result. Data were expressed as mean ± standard deviations for variables. Preoperative and postoperative differences were performed using paired t test and Fisher’s exact test, and statistical significance was set at P<0.05. All analyses were carried out using the SPSS (Statistical Package for the Social Sciences) version 17. The average surgical time was 155 ± 28 min (105-220 min) with a mean intraoperative blood loss of 131 ± 64 ml (50-325 ml). The hospital stay was 5.2 ± 0.9 days (4-7 d). The time to ambulation was 2.2 ± 0.9 d (1-4 d) postoperatively. There was 1 dura tear with cerebrospinal fluid leakage, which was repaired during operation, without other special treatment. 1 patient suffered from pneumonia and recovered after antibiotic treatment. There was no complication of neurologic injury, wound infection, or non-union (Table 2). There has been no breakage or failure of any screw or rod. Table 2. Patient demographics and operative data. The mean VAS back pain scores decreased from 4.55 ± 0.9 preoperatively to 2.2 ± 0.8 at 2 y follow-up (P<0.05), and the mean VAS leg pain scores decreased from 8.2 ± 0.6 preoperatively to 0.95 ± 0.8 at 2 y follow-up (P<0.05). The ODI score improved from 60.56 ± 15.1% preoperatively to 23.46 ± 8.2% at 2 y follow-up (P<0.05). All patients were satisfied with the surgical results (Table 3). Table 3. Radiographic and clinical outcomes in 37 patients. The level of surgery was L3/4 in 6 cases (16.2%), L4/5 in 22 cases (59.5%), L5/S1 in 9 cases (24.3%). The mean Cobb angle decreased from 18.7 ± 5.3º preoperatively to 10.3 ± 5.38º at 2 y follow-up with a mean correction of 8º (P<0.05). The lumbar lordosis changed from -31.4 ± 12.7º preoperatively to -37.4 ± 10.1º at 2 y follow-up (P<0.05). The pelvic tilt decreased from 23.1 ± 7.3º preoperatively to 16.2 ± 7.5º at 2 y follow-up (P<0.05). The sacrum slope changed from 24.8 ± 8.9º preoperatively to 32.05 ± 7.3º at 2 y follow-up (P<0.05). All patients achieved grade 1 fusion at the final follow-up according to radiological evidence, and no obvious loss of correction occurred (Table 3 and Figure 2). Figure 2: A 65 y old male patient suffering from adult lumbar degenerative scoliosis. The main complains were severe back and left leg pain complicated with intermittent claudication. A and B: Preoperative X-ray showed the Cobb angle was 32° and the coronal was imbalance. C-E: Preoperative CT and MRI showed the L4/5 disc herniation. F and G: The X-ray two-year follow-up showed the Cobb angle was 27° and the coronal was balance. H and I: The CT twoyear follow up showed grade 1 fusion. The ALDS is usually caused by the degeneration and instability of the spine. The prevalence of ALDS is reported to be 6% [13-16]. The treatment of the ALDS is in an ongoing debate [17-19]. In order to choose the best option, the Lenkesilva  classification is described to instruct the treatment. The open surgery to correct deformity, which can get good coronal and sagittal balance, is becoming popular. However, for the patients of ALDS, the average age is in the 60’s . The advanced age of the patient often complicated with medical comorbidities, which will add additional challenges to the surgery and increase the complication rate of the patient. According to the literature, the traditional open surgery has been associated with a major complication rate as high as 28-86% , and the risks of morbidity have been shown to increase with advancing age . To combat these challenges, the minimally invasive surgeries have been developed for the treatment of ALDS [23-25]. The minimally invasive spinal surgery can reduce intraoperative blood loss, lower infection rates, and quicker mobilization, which would be highly desired in the adult lumbar degenerative scoliosis population . Rosen’s study  proved that patients older than 75 y with significant medical comorbidities underwent minimally invasive spinal surgery for spinal canal decompression could be efficient and safe. The minimally invasive surgical treatment of ALDS is increasingly being recognized as safe and effective. The technique of MIS-TLIF was first described by Foley , which utilized tubular retractors under radiological guidance by a muscle-dilating approach. This way can reduce the amount of iatrogenic muscle and soft tissue injuries, which was confirmed by many other surgeons [29-31]. According to the former literatures, compared to the open surgery, the MISTLIF surgery generally has minimal blood loss. The patients treated by open surgery generally take three times as long to start walking, and they stay twice as long in the hospital . For the patients of ALDS, the golden standard treatment is decompression, fusion and deformity correction [17,23]. For such patients, we advocated the precise treatment, the mainly goal is to solve the symptom rather than restore the alignment. The surgery should be controlled as small as possible to reduce the complication. In this paper, 26 patients with ALDS whose symptom is mainly single level radicular pain or neurogenic claudication, without dynamic back pain, were treated with the technique of MIS-TLIF and acquired satisfactory results. Compared to the literatures, the outcome demonstrated the technique of MIS-TLIF for patients of ALDS whose symptom is mainly single level radicular pain or neurogenic claudication, without dynamic back pain, to be accomplished within shorter operative time, to be associated with much less blood loss and shorter hospital stays [1,13], which result in considerably less patient morbidity, less cost, and earlier rehabilitation. In our studythe technique of MIS-TLIF to treat patients of ALDS whose symptom is mainly single level radicular pain or neurogenic claudication, without dynamic back pain, acquire excellent clinical result. The nerve root block is a necessary procedure for precise treatment, which can make sure the level where the pain comes from. Then, with the technique of MISTLIF, we can achieve a good decompression, instrumentation and fusion with less injury, relieving patients’ pain and gaining satisfactory clinical outcome eventually. For the patients of ALDS, whose symptom is mainly single level radicular pain or neurogenic claudication, without dynamic back pain, the technique of MIS-TLIF can achieve a good deformity correction. The change of the parameters demonstrated that the technique of MIS-TLIF could improve the balance of the patients to some degree. Through the decompression and the disk resection, the disc was loosened. And by compression and the rod placement, the balance of the vertebrate was improved. Besides, the painful stimulus caused by disc herniation is removed, the nerve root, muscle, ligament is relaxed which are helpful for deformity correction. Earlier studies have shown a significant positive correlation between the radiographic results and clinical outcomes in the surgical treatment of ALDS, which is in accordance with our study [14,33]. There are limitations in this technique. Firstly, the technique of MIS-TLIF has a steep learning curve. Due to the complicated of ALDS, it may be difficult for junior doctor to master such technique and may increase surgical time and blood loss, which induce to loss the advantage of such technique. Therefore, it would be best for the experienced surgeon to perform it. Secondly, the patients of ALDS present many different symptoms. Right now, the technique of MIS-TLIF is only suitable for patients whose symptom is mainly single level radicular pain or neurogenic claudication, without dynamic back pain. The indication for adult lumbar degenerative scoliosis is relatively narrow. We hope in the future, the indication of MIS-TLIF can be applied to more patients. In conclusion, for the patients of ALDS, the deformity correction is not necessary, we advocated the precise treatment to relieve the mainly pain and improve the symptom. For the patients of ALDS whose symptom is mainly single level radicular pain or neurogenic claudication, without dynamic back pain, the technique of MIS-TLIF was safe and effective. The technique of MIS-TLIF is generally associated with less blood loss and pain, earlier ambulation and discharge from hospital which reduce the incidence of the complication. Although the technique is not suitable for all patients with ALDS, it may be an alternative method. Fernando ES, Lawrence GL. 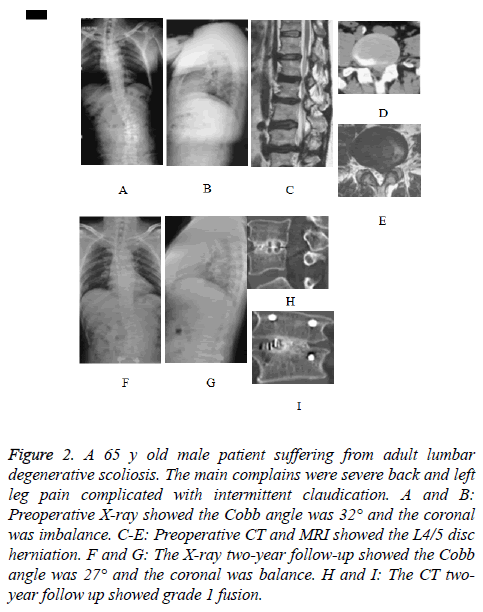 Adult lumbar degenerative scoliosis: evaluation and management. Neurosurg Focus 2010; 28: 1. Cheh G, Bridwell K, Lenke L. Adjacent segment disease following lumbar/thoracolumbar fusion with pedicle screw instrumentation: a minimum 5-year follow-up. Spine 2007; 32: 2253-2257. Cho KJ, Suk SI, Park SR, Kim JH, Kim SS, Choi WK, Lee KY, Lee SR. Complications in posterior fusion and instrumentation for degenerative lumbar scoliosis. Spine (Phila Pa 1976) 2007; 32: 2232-2237. Crandall D, Morrison M, Baker D. Direct vertebral translation to correct adult scoliosis. Spine J 2005; 5: 118. Crandall D, Morrison M, Baker D. Adult scoliosis correction: clinical and radiographic comparison of techniques. Spine J 2006; 6: 150-151. Aebi M. The adult scoliosis. Eur Spine J 2005; 14: 925-948. Boachie-Adjei O, Dendrinos GK, Ogilvie JW, Bradford DS. Management of adult spinal deformity with combined anterior-posterior arthrodesis and Luque-Galveston instrumentation.J Spinal Disord 1991; 4: 131-141. Winter RB, Denis F, Lonstein JE, Dezen E. Salvage and reconstructive surgery for spinal deformity using Cotrel-Dubousset instrumentation. Spine 1991; 16: 412-417. Zheng F, Cammisa FP, Sandhu HS, Girardi FP, Khan SN. Factors predicting hospital stay, operative time, blood loss, and transfusion in patients undergoing revision posterior lumbar spine decompression, fusion, and segmental instrumentation. Spine 2002; 27: 818-824. Dickerman RD, East JW, Winters K, Tackett J, Hajovsky-Pietla A. Anterior and posterior lumbar interbody fusion with percutaneous pedicle screws: comparison to muscle damage and minimally invasive techniques. Spine 2009; 34: 923-925. Mummaneni PV, Tu TH, Ziewacz JE, Akinbo OC, Deviren V, Mundis GM. The role of minimally invasive techniques in the treatment of adult spinal deformity. Neurosurg Clin N Am 2013; 24: 231-248. Kwak YS, Kim KT, Cho DC. Minimally invasive removal of an intradural cervical tumor: assessment of acombined split spinous laminectomy and quadrant tube retractor system technique. J Korean Neurosurg Soc 2012; 52: 427-431. Vanderpool DW, James JI, Wynne-Davies R. Scoliosis in the elderly. J Bone Joint Surg Am 1969; 51: 446-455. Aebi M. Correction of degenerative scoliosis of the lumbar spine. A preliminary report. Clin Orthop Relat Res 1988; 80-86. Swank S, Lonstein JE, Moe JH, Winter RB, Bradford DS. Surgical treatment of adult scoliosis. A review of two hundred and twenty-two cases. J Bone Joint Surg Am 1981; 63: 268-287. Kobayashi T, Atsuta Y, Takemitsu M, Matsuno T, Takeda N. A prospective study of de novo scoliosis in a community based cohort. Spine 2006; 31: 178-182. Tribus CB. Degenerative lumbar scoliosis: evaluation and management. J Am Acad Orthop Surg 2003; 11: 174-183. Daffner SD, Vaccaro AR. Adult degenerative lumbar scoliosis. Am J Orthop (Belle Mead NJ) 2003; 32: 77-82. Pritchett JW, Bortel DT. Degenerative symptomatic lumbar scoliosis. Spine (Phila Pa 1976) 1993; 18: 700-703. Anand N, Baron EM, Thaiyananthan G, Khalsa K, Goldstein TB. Minimally invasive multilevel percutaneous correction and fusion for adult lumbar degenerative scoliosis: a technique and feasibility study. J Spinal Disord Tech 2008; 21: 459-467. Scheufler KM, Cyron D, Dohmen H, Eckardt A. Less invasive surgical correction of adult degenerative scoliosis,part I: technique and radiographic results. Neurosurgery 2010; 67: 696-710. Wang MY, Mummaneni PV. Minimally invasive surgery for thoracolumbar spinal deformity: initial clinical experience with clinical and radiographic outcomes. Neurosurg Focus 2010; 28: 1-8. Schwender JD, Holly LT, Rouben DP, Foley KT. Minimally invasive transforaminal lumbar interbody fusion (TLIF): technical feasibility and initial results. J Spinal Disord Tech 2005; 18: 1-6. Rosen DS, O`Toole JE, Eichholz KM, Hrubes M, Huo D, Sandhu FA. Minimally invasive lumbar spinal decompression in the elderly: outcomes of 50 patients aged 75 years and older. Neurosurgery 2007; 60: 503-510. Foley KT, Holly LT, Schwender JD. Minimally invasive lumbar fusion. Spine 2003; 15: 26-35. Schwender JD, Holly LT, Rouben DP. Minimally invasive transforaminal lumbar interbody fusion (TLIF): technical feasibility and initial results. J Spinal Disord Tech 2005; 18: 1-6. Peng CW, Yue WM, Poh SY. Clinical and radiological outcomes of minimally invasive versus open transforaminal lumbar interbody fusion. Spine 2009; 34: 1385-1389. Villavicencio AT, Burneikiene S, Roeca CM, Nelson EL, Mason A. Minimally invasive versus open transforaminal lumbar interbody fusion. Surg Neurol Int 2010; 1: 12. Kong HL, Wai MY. Clinical and radiological outcomes of open versus minimally invasive transforaminal lumbar interbody fusion. Eur Spine J 2012; 21: 2265-2270. Hioki A, Miyamoto K, Kodama H. Two-level posterior lumbar interbody fusion for degenerative disc disease: improved clinical outcome with restoration of lumbar lordosis. Spine J 2005; 5: 600-607.